“Round and round they go, where they’ll stop, nobody knows” says a popular children’s rhyme. But in the case, it’s more than an apt description of what I witness on a daily basis when I am at work. That’s because the museum I work at in the town of Nederland sits right on the infamous Nederland traffic circle. Three main roads, three very busy, popular roads come into the circle, and with most of those people being from out of town or even out of state, they seem to have no idea what to do. Especially when it’s super busy with long lines of cars in all three directions. Which way do I look? That seems to be the most pressing and confounding thing to most motorists. Programmed to look to your right at a typical 4-way intersection, it seems confusing. But in fact, when you are trying to enter the circle, you look to your left and wait for a break, before hopping into the circle. What to do once you’re in the circle seems equally confusing. I smile as I watch people come to a complete halt while driving the circle. No, no, no – don’t stop! I think to myself as I watch the craziness. Stopping in the circle is a sure recipe for an accident or at a minimum bringing the flow of traffic into the circle to a complete stop. They ought to have rules they post on a sign before entering the circle, or even better perhaps a short video clip on what to do. Nevertheless, the fun goes on. And actually, studies have proven, traffic circles (when driven properly) are much more efficient in keeping the flow of traffic moving than 4-way stops are. Of course, mountain towns in Colorado are not the only places to employ traffic circles. Back in Washington, DC, where I used to live, there were lots of circles — Dupont Circle, Washington Circle, Logan Circle and the list goes on. And outside the U.S., circles abound all over Europe and other continents. By far, the most frightened I have ever been in my life while driving was in Sao Paulo, Brazil, one of the largest cities in the world. Many years ago, while visiting a friend down there, I was thrown to the wolves to drive the streets of a city I barely knew. All due to my friend becoming deathly ill with food poisoning because of bad seafood he had eaten. Too weak to drive after an outing at the beach, I drove his tiny Brazilian car back to Sao Paulo. As we entered the city limits, I approached the largest traffic circle I have ever seen with cars and buses zipping around it in multiple lanes. I realized quickly that counter to the normal philosophy and my gut reaction, rather than stopping as I approached the circle, I was going to have to gun it or risk getting crunched from behind. I sort of half-closed my eyes and stepped on the accelerator. Before I knew it, we were exiting the circle, and I had survived. 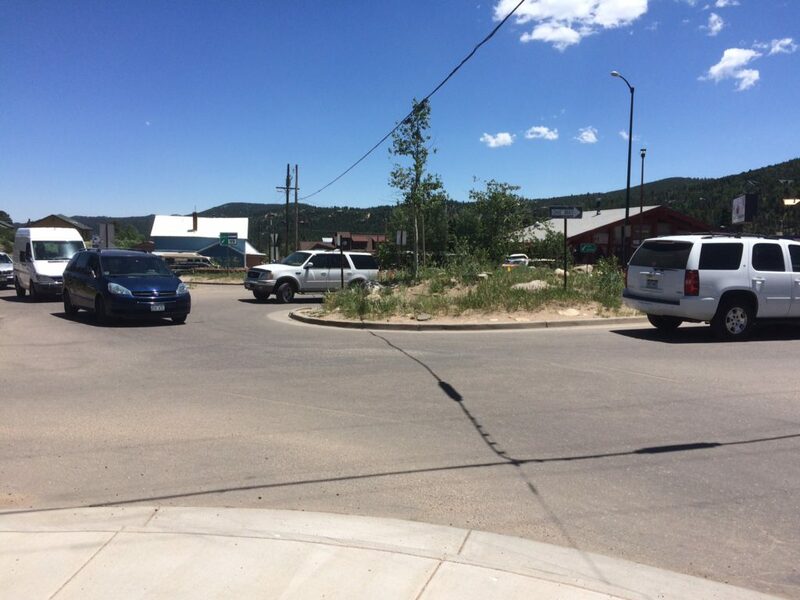 Compared to that experience, our little Nederland traffic circle seems like a piece of cake. Try telling that to that tourist from Nebraska….